A foot sprain occurs when you stretch or tear the ligaments around your foot. Ligaments are the tough tissues that connect one bone to another. A sprain can happen when you run, fall, or hit your toe against something. Sprains often happen when you jump or change direction quickly. This may occur when you play basketball, soccer, or other sports. Most foot sprains will get better with treatment at home. Walk or put weight on your sprained foot as long as it does not hurt. If your doctor gave you a splint or immobilizer, wear it as directed. If you were given crutches, use them as directed. For the first 2 days after your injury, avoid hot showers, hot tubs, or hot packs. They may increase swelling. Put ice or a cold pack on your foot for 10 to 20 minutes at a time to stop swelling. Try this every 1 to 2 hours for 3 days (when you are awake) or until the swelling goes down. Put a thin cloth between the ice pack and your skin. Keep your splint dry. After 2 or 3 days, if your swelling is gone, put a heating pad (set on low) or a warm cloth on your foot. Some doctors suggest that you go back and forth between hot and cold treatments. Prop up your foot on a pillow when you ice it or anytime you sit or lie down. Try to keep it above the level of your heart. This will help reduce swelling. Do any exercises that your doctor or physiotherapist suggests. Return to your usual exercise gradually as you feel better. Your toes are cool or pale or change colour. Your wrap or splint feels too tight. You cannot put any weight on your foot. 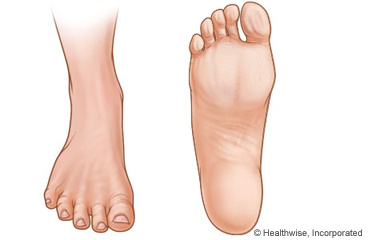 Enter E745 in the search box to learn more about "Foot Sprain: Care Instructions".